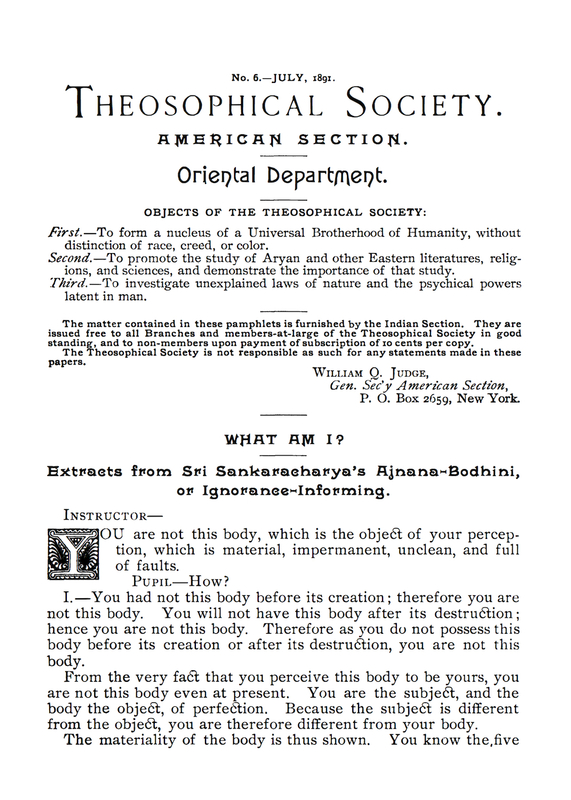 Summary: Theosophical Society American Section , Oriental Department. New York, NY. Publisher: Theosophical Society, American Section. Editor: W.Q. Judge; Charles Johnston. 1/1, January 1891-March-April 1897. 34 issues. 12-16 pp., varies. Subscription to the journal was included in the dues of the American Section of the Theosophical Society. With January 1896, the journal's numbering was restarted at no. 1 and the title changed to Oriental Department Paper. This was Judge's attempt to fulfill the obligations of the Second Object of the Theosophical Society: "The study of ancient and modern religions, philosophies, and sciences, and the demonstration of the importance of such study." In the Path (February 1891) he announced that "through this Department the General Secretary hopes to be able to furnish a fund of valuable and interesting information such as cannot be otherwise obtained except at great expense for books and other means of study. It is certain that what little has been said to our people by interested missionaries and travellers has been very wide of truth in respect to the people of Asia, their manners, customs, literature, and social life. Indeed, but little can be got from Asiatics by such agents, and it is believed that only through our Society the real truth may be reached. Such a general and correct knowledge of distant people, all brothers of the same human family, will do much to enlarge the boundaries of our thoughts, to abate race prejudice, and in all ways tend to strengthen the feelings of brotherhood which it is the aim of the Theosophical Society to Arouse. Nor is there any reason why the T.S. should not be a great Asiatic investigating Society." To help supply proper Indian learning, Judge "concluded an engagement" with Prof. M.N. Dvivedi, a professor of Sanskrit, to supply material. In 1894, Judge sought the assistance of Charles Johnston, the husband of H.P. Blavatsky's niece, who continued the journal after Judge's death. A similar publication under the title Oriental Department was put out 1893-1894 in London by the European Section. Harvard University; University of California, San Diego.